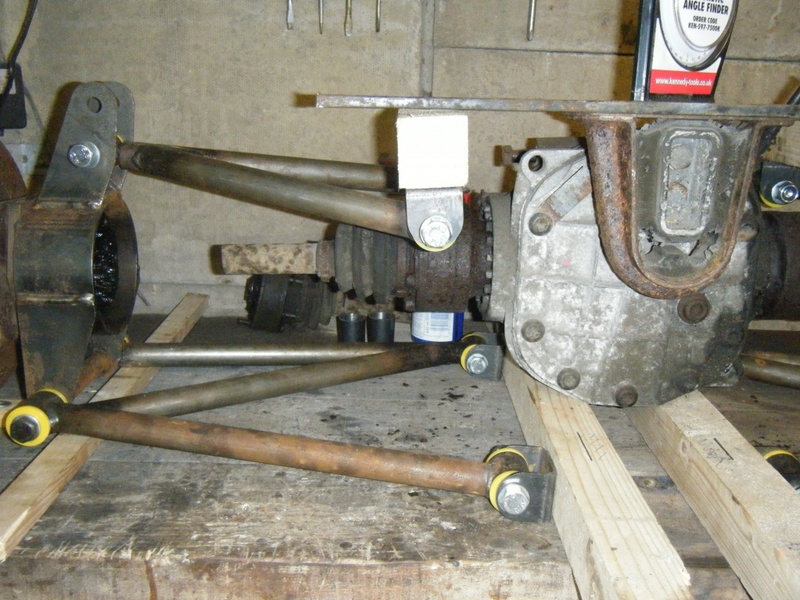 Westfield axle shafts are shorter by a few inches and are different lengths each side, ok if you want to play with the overall width of the car and not too pricey compared with chopping and re-splining. Anyone can drive a fast car, not everyone can drive a car fast!!!! 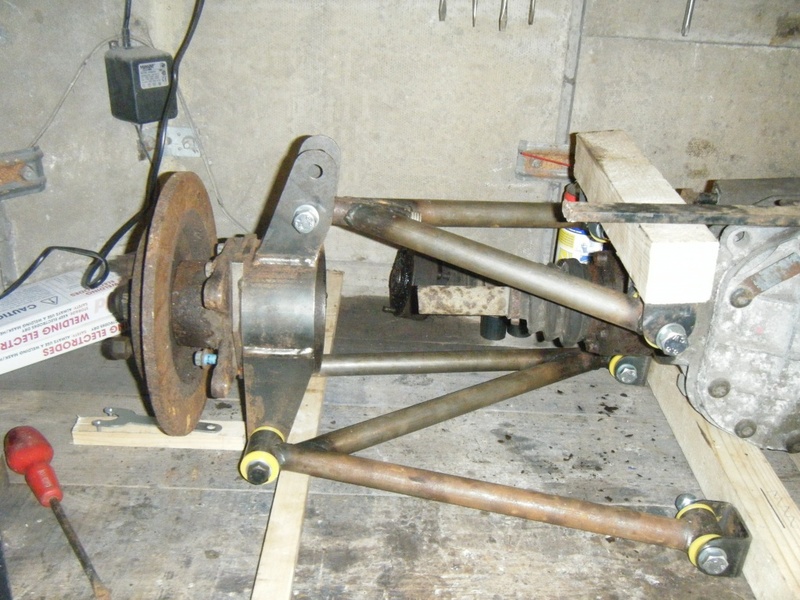 hi, just started to mock up the rear axle, im going for 48 inch wide , as regards the drive shafts they need to be about 12.5 inches long, can they be welded and sleeved or do they need to be resplined?. 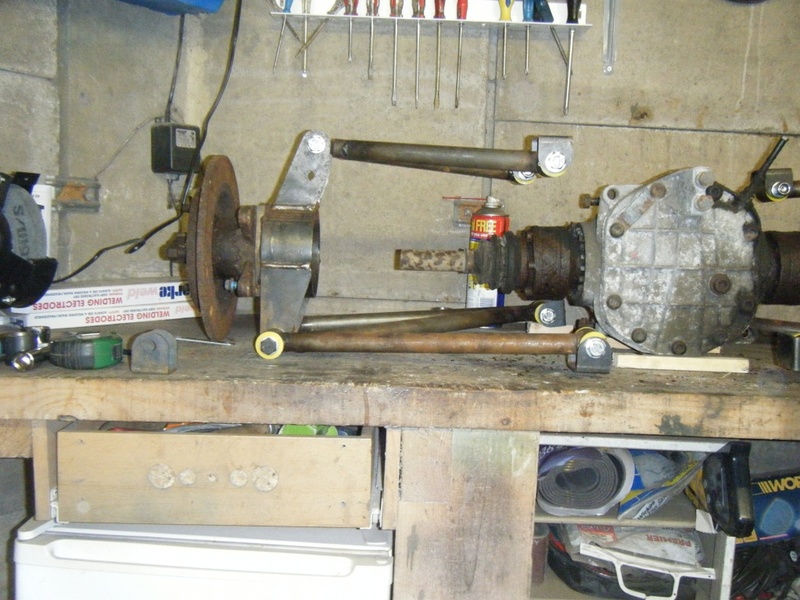 I have had welded and sleeved axle shafts before and it didn't matter what process I did, i.e. sleeving and welding, machining and press fit spigot, arc or tig welding it either broke just past the weld or through the weld if the filler rod was too soft, I was running a 360bhp manual shifted 289 so there was a reasonable amount of torque but I never 1/4 mile'd it with them I then had them cut and splined then the tips of the splines heat treated and I then gave it full abuse and I never had any more trouble. This was on a 28 slpine 9"inch with detroit locker. So my advice would be to cut and resline if you are going to give the car a hard time off the line. 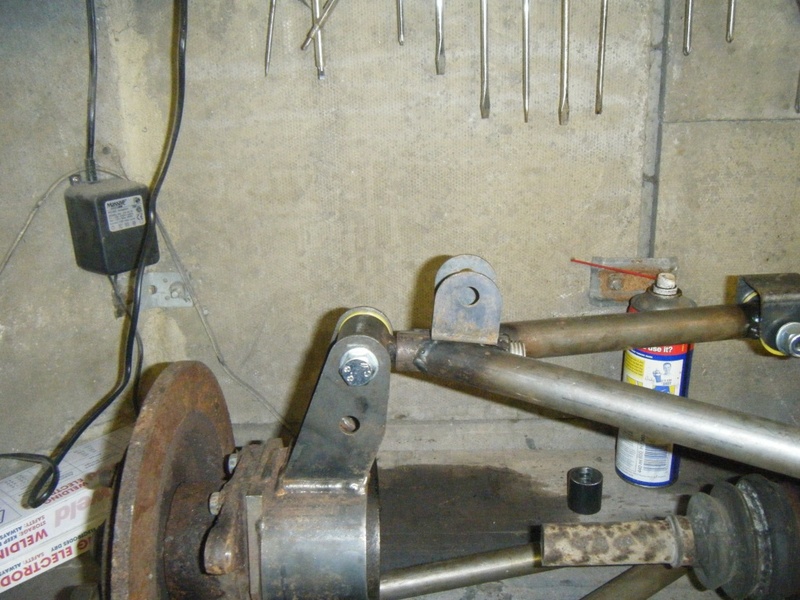 Oh I have just had another thought regarding your rear end (of the car) you need to be careful to make sure the cv joints pivot on the correct axis line when the wishbones go up and down, so you need to be very careful when you design the wishbones and pivot points and wishbone length and angle. If they don't all work nicely together on the correct radius through the suspension travel you can have the joints pop out or bind in the end and you may keep braking cv joints. This was just one of the design issues I had to work out on my build when I designed my system, but as mine are longer than yours are going to be, you will find for the same suspension travel you will get much more angularity on the shafts and the wishbones. Sorry to mention all this basic stuff I don't want you to think I am trying to tell you stuff you may already know, but if you didn't then I hope it helps. On quick inspection of your mock up my opinion would be to lower the hub until the centre of the drive shaft hole in the hub is approximately 1/2" lower than the centre of the diff drive flange. When at the calculated ride height setting the drive shaft should slightly angle down hill towards the hub side and the inner pivot of the lower wishbone should be approximately 1" higher than the the outer pivot point on the upright, maybe slightly less as you are going to have narrower wishbones but I would say as a ball park figure between 1/2" and 1". The top wishbone should probably angle down 3/4" to 1.5" depending how much the lines are converging to work out your roll centre, ideally you need the roll centre to be higher on the back than on the front to obtain stable handling and consistent road manners. I think the top wishbone needs to be mounted higher on the upright more likely closer to the position of the shock mounting hole so that the inner pivots are further away from the drive shaft flange centre. 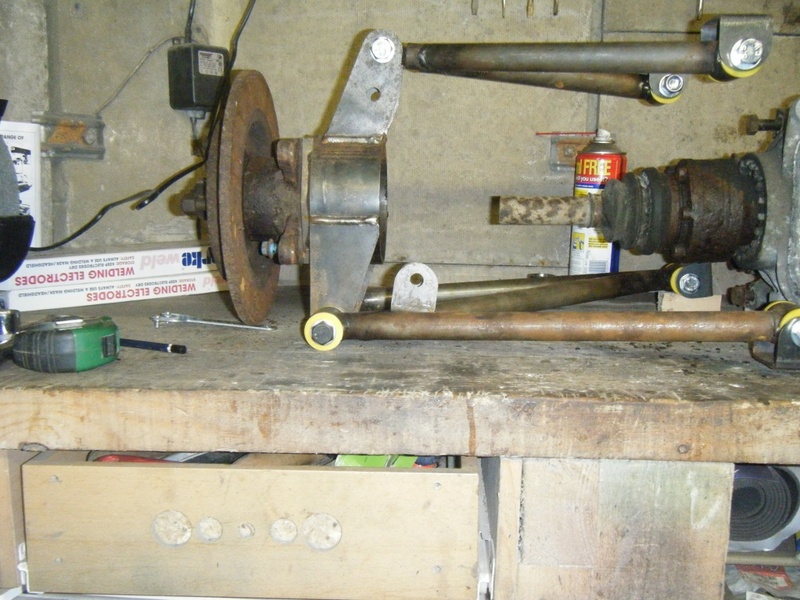 Also if you are going to be having the car lowish then I suggest you mount the coil over shock not on the top of the upright but fabricate a strong mounting on the lower wishbone as you will probably make things hard for yourself getting your coil overs mounted outside the bodyshell. 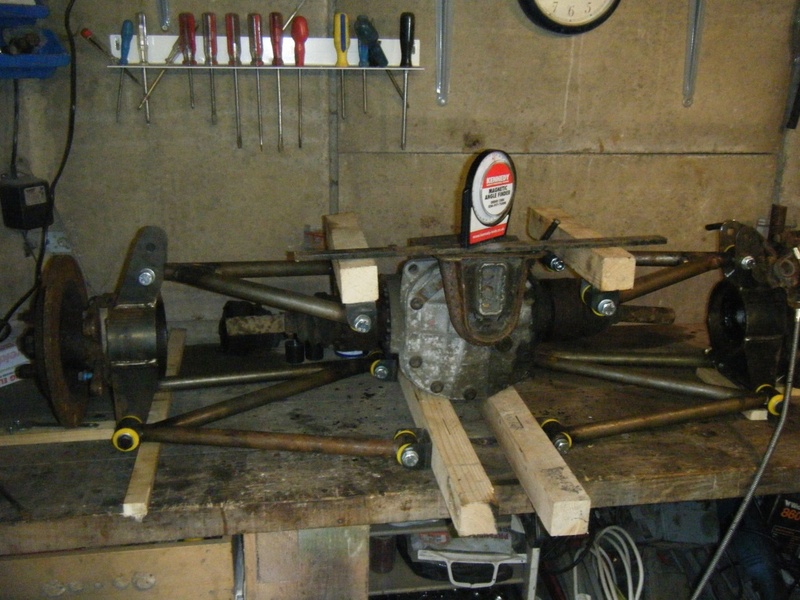 On my build I have mounted them off the top of the hub and the shocks are going to be a tricky item to cover but with my build I am only having 2 seats and I put them specifically on top for better handling and as I am using rose joints this way lessens the bending forces going through the joint as all the weight of the car goes straight through the hub into the wheel. Sorry if this all seems like a meandering pile of junk but it is just some of my thought processes going through my head about your project. thanks 20vT-pop, very usefull info and lots to think about, i need to jen up a bit , the wishbones in the pics are set up as per the locost book with the bottom wishbone level and the top one set at 5deg down to the centre , the diff in the pics is set a little high it should be parallel to the bottom wishbone. 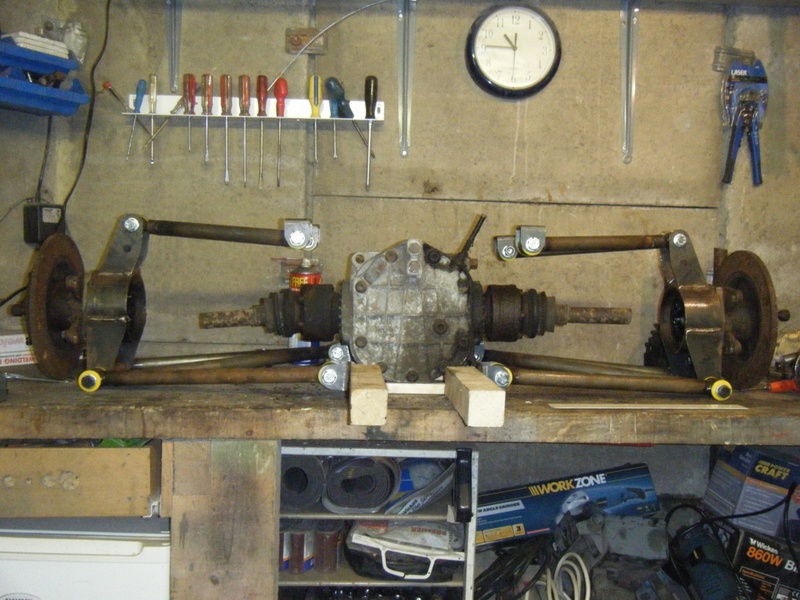 I will do another mock up to your info, if it all gets too complicated i may revert to a solid axle with four bars. just a quick up date, after advice from 20vT-pop have now changed angles of wishbones and not wanting too short top wishbones i have changed the width from 48 inch to 50 inch, hopefully this should help . Regards the coil overs would i get away with 1 coilover per side per lower wishbone or should i have two per lower wishbone?. I now need some box to make a working mock up, a few updated pics. Looking at your hear upright you may be able to mount the shock absorber from that if you weld a substantial boss onto it, you would need to make sure that you had brake calliper clearance, also you would need to beef up the lower wishbone with a couple of extra tubes welded in between the ends of the mounting eyes possibly about 50mm before the ends to give more torsion stiffness then you should be ok to run 1 rear coil over, I would also box in the outer side of the top wish bone mount if you are running the top joint on the top hole to about 15mm below the bottom of the top bolt hole to strengthen up the top of the mounting. Overall it looks a lot better with the mounts further apart.